Variscite is a relatively rare hydrated aluminium phosphate mineral. It is sometimes confused with turquoise; however variscite is usually greener in colour. Variscite often contains white veins of the calcium aluminium phosphate mineral Crandallite. 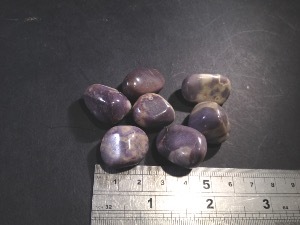 Purple Variscite tumbled to a smooth finish, an ideal pocket size stone, small enough to carry around with you. 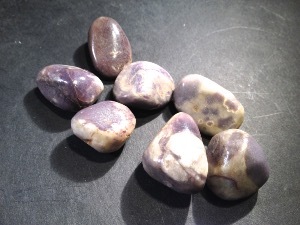 Tumble Stones can also be placed around the home for their energies or can just be nice decorative items.